Our Biblical text for today’s blog is found in Matthew 24:24 and Mark 13:22. The worldly standards that have been promoted during this generation in “Christian America” have become SO strong and far-reaching that we cannot hope to avoid the effects of the warfare in which we are involved. The devil has never enjoyed so many opportunities to tempt people as effectively as he does today by utilizing our mass communication system. At no other time in history have Christians faced attack on so many fronts, having to deal with such means and continuously tempted with the standards and ways of the world. Satan’s evil enticements are made conveniently available, and all too often, we find his offerings irresistible. And we have been encouraged to think his ways are harmless. An important lesson for us to learn is that our value of righteousness can only be compared to God’s standards, which never change. As the world’s values have drastically deteriorated in recent years, only managing to maintain the same distance between our values and the world’s means that our values have also deteriorated. That is why many of the more worldly values of twenty to forty years ago have now become an acceptable living standard for so many Christians. “I am not as bad as the world” is not an acceptable thought for Christians. It is a deception that leads us to compare our standards with the world’s rather than comparing them only with God’s. Deception breeds compromise, and compromise leads to spiritual defeat. Are you beginning to see why the God-given prophecy of Jesus, comparing the days of Noah to our day, was recorded in scripture? Over-commitment to the everyday affairs of life has caused the majority in our society, including many Christians, to ignore or pay very little attention to the signs of the times. Therefore, almost nothing has been done to guard against the deceptive spiritual warfare that Jesus and others prophesied would take place in our day. The fruit produced by the body of Christi during the past generation proves this statement to be true. The enemy is using the influence of our modern-day worldly society to attach Christians, and its working! Far too may have lost most of their ability to discern right from wrong and we are unaware of the things Jesus warned us about. He said in Matthew 24:24 and Mark 13:22 that even the elect (Christians) would be deceived in our day. The truth of this prophecy is difficult to swallow, but the “spirit of merchandising” has captured the heart of most Americans far beyond what might be considered normal over the history of mankind. I will repeat: The capability of our society to produce so many consumer products, along with the highly skilled advertising that constantly focuses our attention on these products; a media system that delivers this advertising right into our homes; easy credit, often with no down payment; and beautiful shopping malls, have come together to make this prophecy a present-day reality. 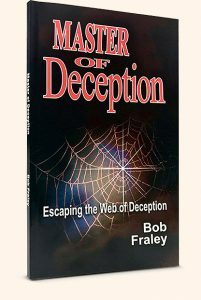 The enemy’s deceptive attacks have been very difficult to discern in our modern-day world. Our lack of concern and apathetic attitude regarding the many sins that are now out in the open in our society are revealing fruit of this deception. We need to examine the fruit or actions of our lives compared with God’s word. This is the only way to determine whether the enemy has deceived us. To turn this condition around in the body of Christ, we need a Heaven-sent, Holy Spirit-operated revival. We should be praying for such a revival if we want to save biblical values in our country. Remember this, when we live watchfully as our Lord instructs us, we will begin to experience the joys of personal revival.